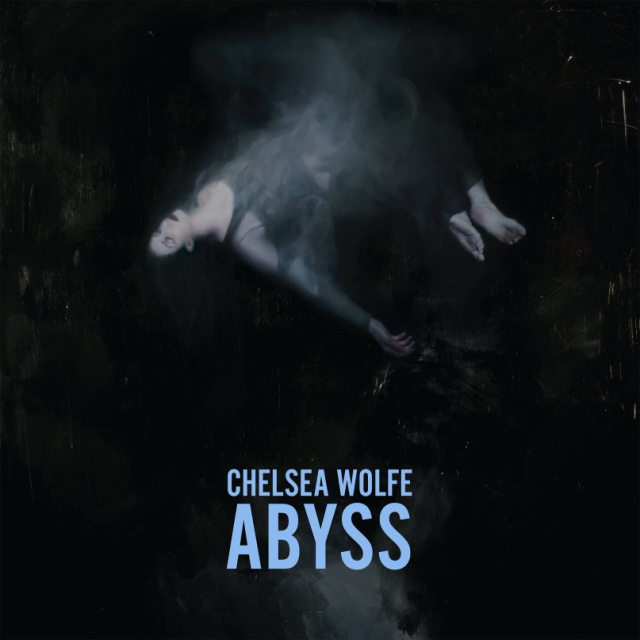 Abyss is the kind of title you’d expect from someone like Chelsea Wolfe. The Grime and the Glow, Apocalypsis, Pain Is Beauty: the LA songwriter has consistently pulled off ambitious titles, all drenched in pathos and doom. Her sensibility is rooted somewhere between those poles, a sort of post-goth romanticism for the musical omnivorous, one where images of death and pain go hand in hand with blinding passions, and genres are explored in erratic fashion. Indeed, what’s striking about Chelsea Wolfe’s career so far is how she kept expanding her musical palette while maintaining her own aesthetic so intact. Her breakthrough album Apocalypsis (2011) picked up where The Grime and The Glow (2010) left off, transitioning from a noisy impressionism to a more full-bodied sound (the two versions of her track ‘Moses’ exemplify a confidence-boost of sorts). Yet Apocalypsis‘ brooding moments ended up obfuscating Wolfe’s fieriest side, to the point that the lacerating screams of the intro ‘Primal/Carnal’ didn’t quite gel with the rest of the record. The collection of acoustic songs Unknown Rooms arrived a year later, trading Apocalypsis‘ witchery for an enveloping, spectral minimalism that showcased her abilities as a songwriter and the versatility of her glacial voice. In Pain Is Beauty (2013) the ‘beast within’ finally came to the fore. Wolfe’s austere compositions drew comparisons to the ruthlessness of metal, while the occasional, dance-oriented treat (‘The Warden’) fascinated coldwave enthusiasts. But a song in particular, the eight-minutes long ‘The Waves Have Come’, foreshadowed what Abyss would turn out to be: a testament to the epic side in Wolfe’s vision. Recorded in Dallas at John Congleton’s studio, Abyss sounds heavy, both sonically and lyrically, in the sense that it conjures up images of ‘oppressive’ beauty, afterlife and unconsciousness (so dear to the goth-rock domain) with shamanic force. Although the emotional states Wolfe sings about are always too menacing and shaky to be trusted, she sounds more confident than ever in letting these internal battles build up and eventually erupt. Wolfe injects old tropes with new life, never sounding derivative. Reportedly inspired by ‘sleep paralysis’ and the ‘boundaries between dreams and reality’, these eleven songs could appeal to fans of metal, folk, industrial and alternative rock in equal measure, bolstering her cred as a crossover artist. Joining her in the effort are multi-instrumentalist and co-producer Ben Chisholm, ex-Gown Ezra Buchla (viola) and Russian Circles’ Mike Sallivan (guitar). The opening track ‘Carrion Flowers’ epitomises the punishing side of the record, interspersing Wolfe’s brittle vocals with obsessive percussions and squelchy guitars. With stark electronics filling the gaps, it’s Wolfe at her most industrial. Through abrupt interchanges of quietness and distortion, ‘Iron Moon’ seamlessly combines the distilled sadness of the dirge with the over-the-top discharges of metal, all in the name of drama (“My heart is a tomb”, she sings). By the time the lonely guitar of ‘Maw’ enters the room accompanying her lament (a repeated “Where are you”? ), we immediately reconnect with Wolfe’s introspective side, but instead of settling for a balladry of the comforting kind, the song soon morphs into a thickly textured tale of epic proportions. In fact, while most of the tracks on the album showcase similar climactic structures (‘Dragged Out’; ‘Color of Blood’), the subtlest variations are more than enough to enrich the overall feel of the record. The tonal upsurges and feeble electronics of ‘After The Fall’ create a hallucinatory suspense while Buchla’s viola mitigates the oppressive atmospheres of ‘Grey Days’ (“How many years I have been sleeping? Nobody ever said I was alive”) and the titular ‘The Abyss’. Respite comes in two unexpected forms: the organ-led ‘Simple Death’ registers as a pop gem, while the drony ‘Survive’ sees Wolfe breaking the monotony of a lamentation with the ‘odd’ melisma. Abyss proves that there’s still much work to do in the dark side of alt rock. Chelsea Wolfe is surely ahead of the curve.